6 red LEDs: 6pcs with wavelength 620-630nm, rich sources in red light are more efficient and beneficial for photosynthesis, best for flowering and seed production. 4 blue LEDs:4pcs with wavelength of 460nm, blue light is more necessary for Chlorophyll and Carotenoid, good for the photosynthesis, best for promoting the stem and leaf.
" PPUNSON" BRAND : This dual head lamp is initially designed and developed after a large number of customer surveys by "PPUNSON" , please confirm whether the seller you order from is PPUNSON or not before ordering . LEDs COMPOSITION : 6 red LEDs + 4 blue LEDs, emits the wavelength of light that can be fully absorbed by plants photosynthesis, best for blooming, fruiting and promoting the leaf, can help accelerate the growth of indoor plants. "PPUNSON" DESIGN : 1. two heads achieve 360-degree coverage of plants (It can cover a larger area in the case of the item itself does not take up space) ; 2. double switches make it more convinient and safty to use ( one switch independently controls one lamp head and you needn't to plug in/out the socket frequently ) ; 3. 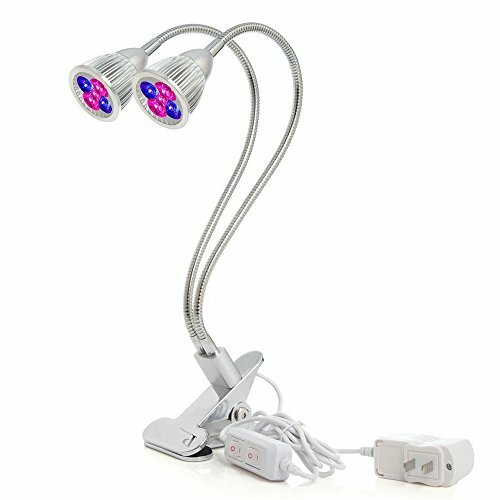 PLEASE NOTE : This grow light use parallel circuit , which means you can flexibly turn on one or two head according to actual condition. If you have any questions about this product by PPUNSON, contact us by completing and submitting the form below. If you are looking for a specif part number, please include it with your message.